French-born composer (22 December 1883, Paris, France - 06 November 1965, Sullivan Street, Greenwich Village, New York, USA). "I Long for instruments obedient to my thought and whim, with their contribution of a whole new world of unsuspected sounds, which will lend themselves to the exigencies of my inner rhythm." Varèse. June 1917. Edgard Varèse has been credited as the "Father of Electronic Music". 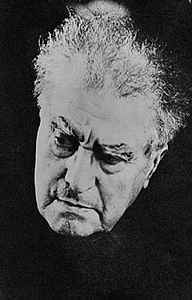 He is often credited as Edgar Varese. Varèse grew up in the Burgundian village of Le Villars and returned to Paris in 1890. He then moved with his family to Turin, where his early attempts at composition began. Varèse married actress Suzanne Bing, 05 November 1907. His daughter, Claude, was born in 1910 and he divorced Bing in 1913. In 1917 he met Louise Norton and married her, 17 January 1922. Edgar Varèse (1883-1965) studied with Vincent d'Indy at the Schola Cantorum (1903-5) and Charles-Marie Widor at the Paris Conservatoire (1905-7), then moved to Berlin, where he met Richard Strauss and Ferruccio Busoni. In 1913 he returned to Paris, but in 1915 he emigrated to New York; nearly all his compositions disappeared at this stage, with the exception of a single published song and an orchestral score, Bourgogne (1908), which he took with him but destroyed towards the end of his life. Igor Stravinsky's early ballets, sets out to discover new worlds of sound. In 1921 Varèse and Carlos Salzedo founded the International Composers' Guild, who gave the first performances of several of Varèse's works for small ensemble, these prominently featuring wind and percussion, and presenting the innovations of Amériques in pure, compact form: Hyperprism (1923), Octandre (1923) and Intégrales (1925). Arcana (1927), which retums to the large orchestra and extended form with perfected technique, brought this most productive period to an end. There followed a long stay in Paris (1928-33), during which Varèse wrote Ionisation for percussion orchestra (1931), the first European work to dispense almost entirely with pitched sounds, which enter only in the coda. He also took an interest in the electronic instruments being developed (he had been calling for electronic means since his arrival in the USA), and wrote for two theremins, or ondes martenot, in Ecuatorial for bass, brass, keyboards and percussion ( 1934). The flute solo Density 21.5 (1936) was then Varèse's last completed work for nearly two decades. During this time he taught sporadically and also made plans for Espace, which was to have involved simultaneous radio broadcasts from around the globe; an Etude pour Espace for chorus, pianos and percussion was performed in 1947. Then, with electronic music at last a real possibility owing to the development of the tape recorder, Varèse produced Déserts for wind, percussion and tape (1954) and Poème Électronique (1957-8), devised to be diffused in the Philips pavilion at the Brussels Exposition of 1958. Varèse's last years were devoted to projects on themes of night and death, including the unfinished Nocturnal for voices and chamber orchestra (1961) [Which was completed by Chou Wen-chung].